Epitomising old school musical theatre, Thoroughly Modern Millie is a show that boasts a tremendous score and excellently witty dialogue. Set in the roaring twenties, small-town girl Millie Dillmount has packed her bags and set off to New York City to start her new life and make her dreams come true. She cuts her hair, shortens her skirt and throws herself naively into New York Life, with a plan to become a secretary and marry her wealthy boss. However, in true musical theatre style, things don’t quite go to plan. As she settles herself into the Priscilla Hotel, she meets a wealthy young girl named Dorothy who wants to lead a normal life – so they teach each other how the other half live. Joanne Clifton leads the cast and she excels in the role of Millie. The strictly star’s dance ability is obviously exceptional and bursting with expression, but I was also incredibly impressed by her voice. Vocally it is a heavily demanding role, with huge belt notes that are quite often tied into huge tap numbers, but Clifton pulls it off superbly. Her animated performance displays the sporadic nature and exaggerative character excellently – Clifton shines in the role. Her best friend Dorothy, played by Katherine Glover, is the complete opposite to Millie. Desperately trying to become an actress, she is highly poised, well dressed and has a polite exterior. Her charming vocals reach unbelievable notes, and there is an element of comedy as she is constantly singing about how in love she is whenever she first meets a man. Millie is constantly bumping into the charismatic young Jimmy (Sam Barrett) who attempts to win her heart, and although she is falling for him, she keeps convincing herself that she shouldn’t be going after men that aren’t wealthy. Described as a musical comedy, the production certainly pulls out all of the stops when it comes to the over the top characterisation. Hotel owner Mrs Meers (Michelle Collins) presents herself as an old Chinese woman, despite actually being a wanted criminal. The two sidekicks Ching Ho and Bun Foo pander to her manipulative orders, and their lack of English provides great comedy. However, I was disappointed by Michelle Collins’ performance as Mrs Meers, as she didn’t have the natural humour that I’ve seen in the role before. Director and Choreographer Racky Plews has brought the musical to life with top-notch choreography and impressive tap numbers. It’s a laugh-out-loud show, but Graham MacDuff steals the show as Millie’s wealthy boss Mr Graydon, as he stutters and stumbles on stage drunk after having had his heart broken. The short scene extends into a strong ten minutes; all of which is brilliantly funny as the audience erupted with laughter. 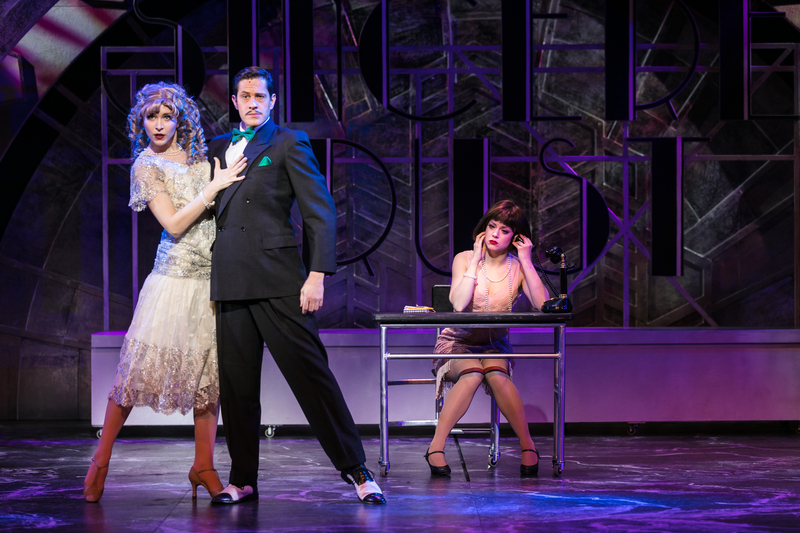 With a sensational leading lady, lavish musical numbers and hilariously funny dialogue – Thoroughly Modern Millie is a theatrical treat! On at the New Alex Theatre in Birmingham until the 18th of Feb.